Thanks for asking. All is well at my end. 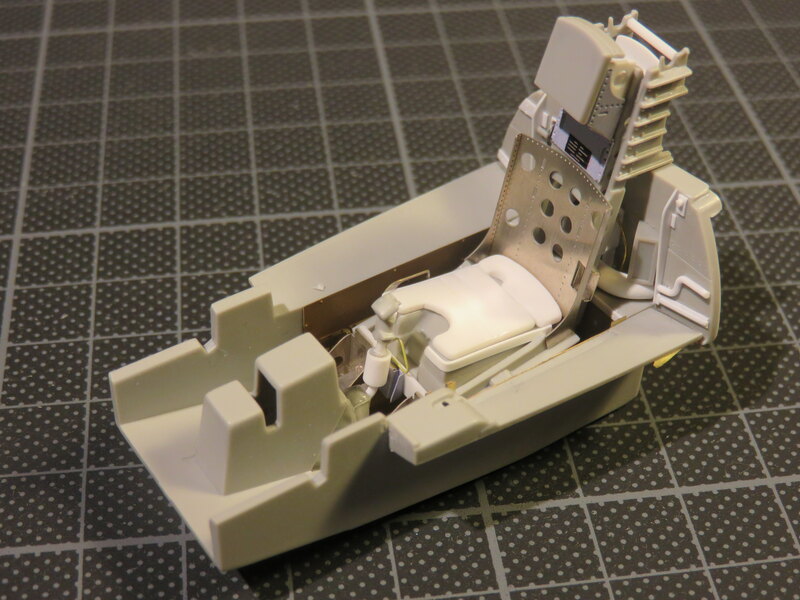 Your build is certainly going to be on a different level then just about all the F-104 builds I've seen in 1/32 scale. That seat it's definitely an improvement in the kits relatively nice parts. 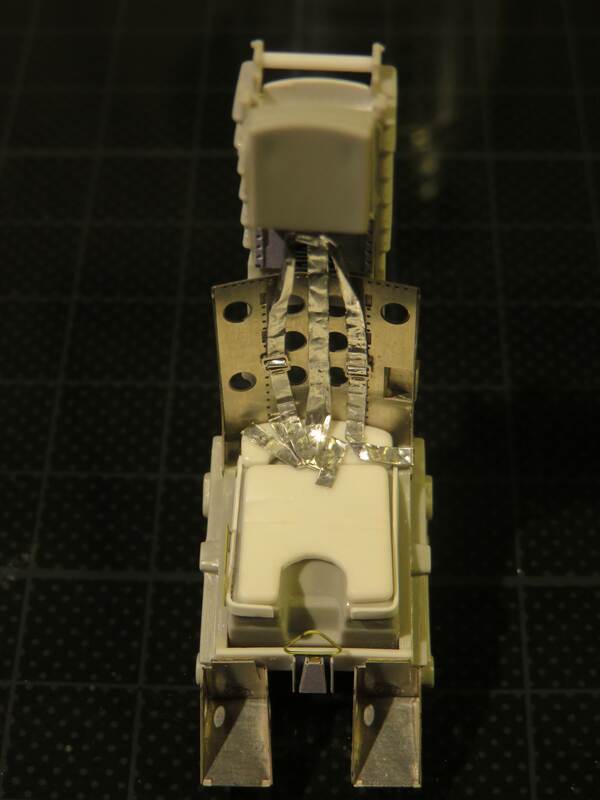 Truly the thinness puff pressed metal parts can only be poorly mimicked in styrene. Thanks very much. Kind words indeed. I'm throwing everything I have at this one so it feels good to see the progress so far. It's a lot of fun too, and I guess that's the point in the end. Gaz, I might have something to contribute to the group build over on Armorama too, but that's another story. See you here soon guys. I agree with the others. The work on the seat is incredible. Looks like to your stick to plan! looking forward to the rest of the cockpit. Thanks a million. Its a pleasure to have you looking in, and Walter that virtual cockpit tour is lovely. I can see places where I should make corrections, but I might just live with an over all impression. Weekends are usually lovely things. Mine was only a bit lovely, I made some more progress and promised myself I would upload some photos. That was before the worst cold I have had in years got hold of me. Achoo! Finally I have crawled out of bed and taken some shots. I’ve also thought about how we (or is it just me?) come to accept some modelling myths. The myth I refer to is that photo etch improves accuracy. It can of course and it certainly adds detail, but its only as good as the researchers and designers that make it - just like a kit. 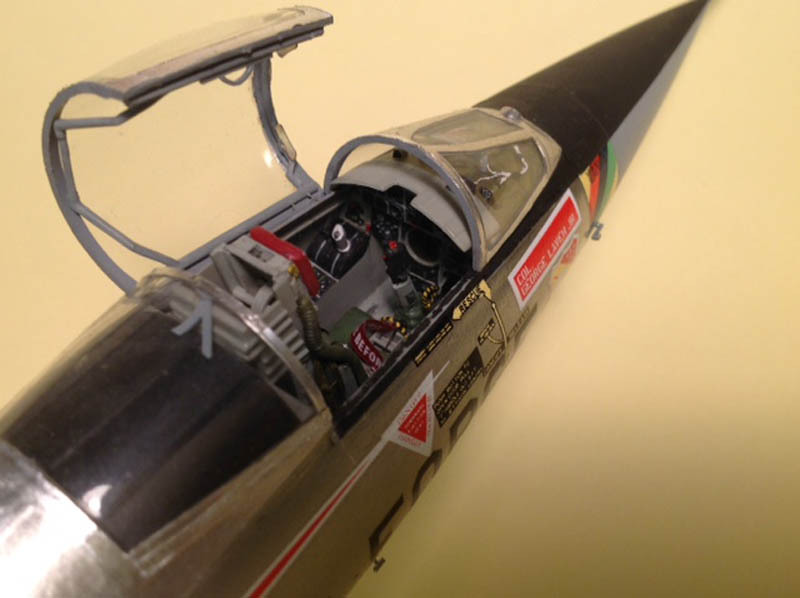 I say this because in the process of building the F-104C’s cockpit I’ve come to realise that what you get if you diligently follow Eduard’s instructions and add them to the Italeri kit parts is a sort of hybrid ejector seat. Its somewhere between the seat found in A and C model F-104s it seems to me. 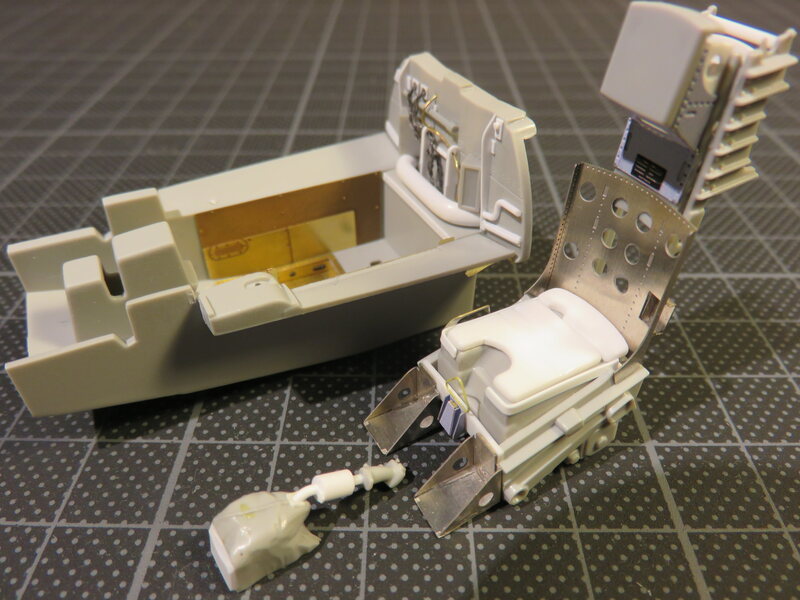 Of course I realised this too late, so I restored some kit supplied details that I had previously removed and did the best I could to scratch an F-104C seat as it would have been in 1965. A bit more adjustment mainly to the joystick got me the parts below. 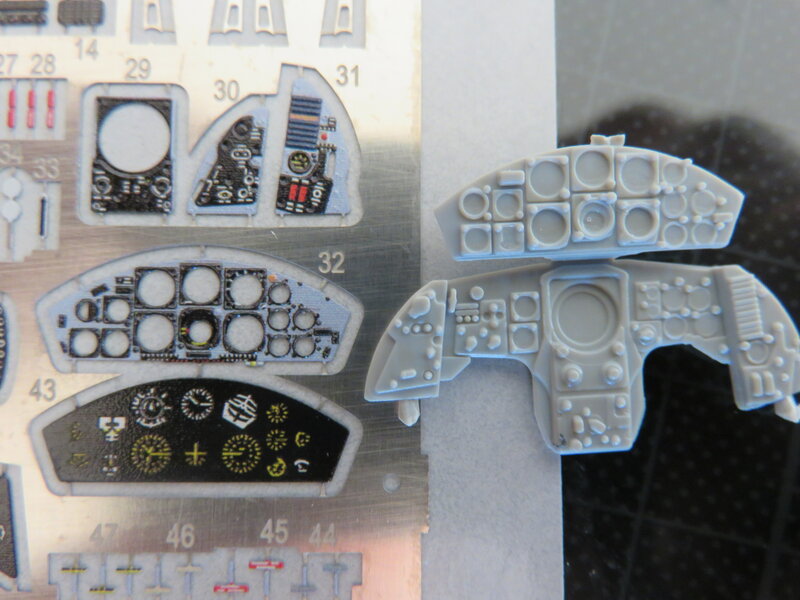 By the way the main sub-assemblies aren’t glued in the second and third shots. Im keeping them apart to make painting easier and to add a few final details. And talking of painting, one of the little gems in Italeri’s kit is the dashboard. Its very well detailed and looks to me like it will be fun to paint. I think it has more potential than the rather flat photo etch. The main advantage of the PE is the detail in the dials, but there are other ways of getting those. So decision made. I’m using the kit part and getting out the paints. I might add a few levers from the Eduard set just to add some final microscopic details that no one will see with the naked eye. Here’s the kit part compared to the PE. Leave a comment below or thumbs up if you like the kit part better than the PE. Oh and don’t forget to scribe so I get more money. Wait, this isn’t Youtube is it? Achoo. Damn, still not fully better. the cockpit is simply amazing. Your added detail just adds so much to it, yet blends in so well that once painted and weathered will look as though it was molded by Aires as a single unit. It's that good. Wow, I'm flattered and pleased the work is paying off. Its a labour of love of course. I just took a look at the fuselage halves and they seem huge compared to the work I've been doing on the cockpit. There's a whole different challenge there. The first time I ran headlong into this was with Eduard's old etched set for the notoriously shallow Trumpeter 1:32 P-40 cockpit. Rather than replace everything, the etched upgrades were made to fit the kit. So they were better detailed, but didn't tackle the fundamental problem. Yup, I'm learning the hard way - that is the expensive way! Even so, the PE is helping but its definitely not a fix for all the kit's problems as you said. And of course there's coloured photo etch to throw in too. If you have an itch then you have to scratch it. I have two itches. The first is missing detail, the second is pre-coloured photo etch. First itch first - the missing detail. 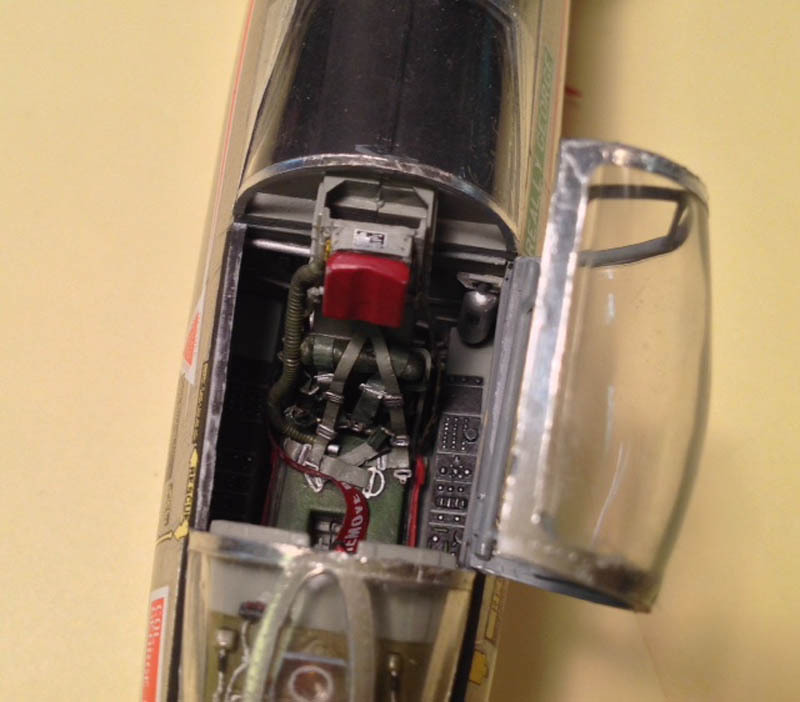 On the left side of the ejector seat is a corrugated hose. I guess this must connect to the pilot’s breathing gear when he is in the office. It is not supplied in the kit and there’s nothing from Eduard, so it was time to scratch. 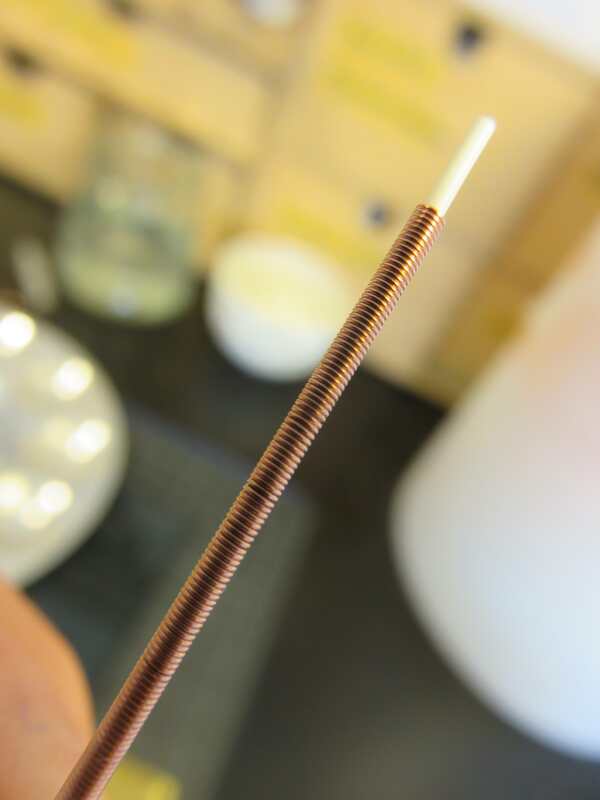 I used a piece of Evergreen plastic tube and wound copper wire around it until I got a corrugated effect. Winding the wire is easy as long as it is held in place when you start. After some experimentation I found that drilling a small hole and inserting the end of the wire to secure the first turn worked well. Only the ends are glued with a dab of superglue. And here we have it. It’s not terribly flexible but it doesn’t need to be. Itch two is that coloured photo etch. It works well on flat pieces but is problematic when you have to bend it. The paint flakes off at the bend, leaving a ridge. What’s more it is springy like all photo etch. 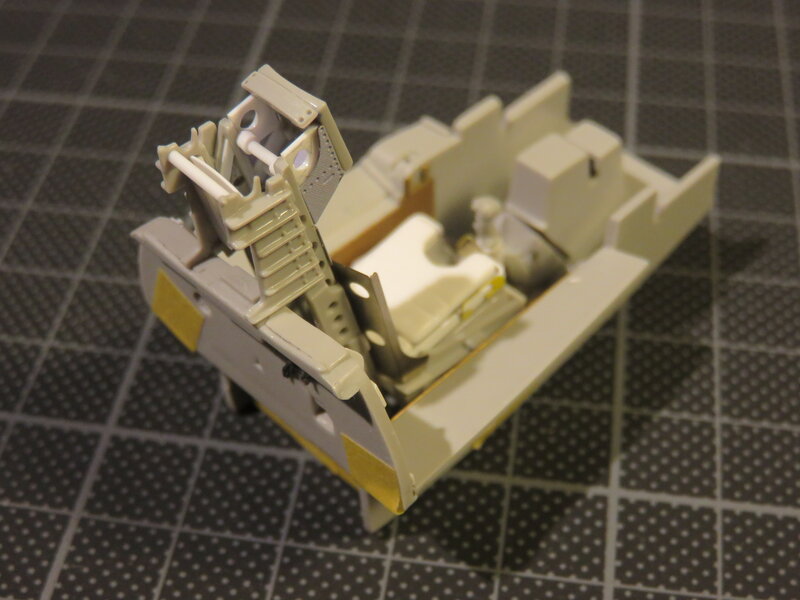 I tried making up the seat belts but I was unhappy with the results so I decided to scratch build again. Ideally I would have used lead sheet but I didn’t have any. After some further experimentation I hit on a solution that I really like. 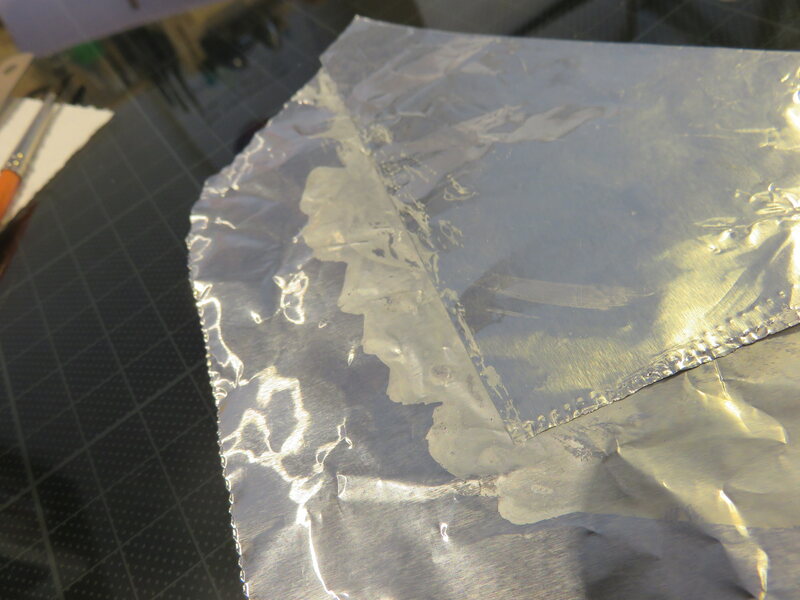 I laminated kitchen foil using diluted PVA glue to stick the sheets together (PVA works best on the dull side). Four laminated sheets got me a flexible but strong material that can be folded and bent and gives a good impression of the folds in webbing type material. A bit of fiddling got the Eduard PE buckles in place and I had a method of making - what look to me like - more authentic straps. Here’s a few shots of the process and the end result. That's a great tip to use laminated foil Steve, I think you've nailed the effect as the scale thickness of the belts looks pretty convincing to me. I just noticed in the last photo that you've got some creasing in the seat cushion? That should stand out a lot better with paint and soften the look of the 'slab' of plastic. Thanks very much. I tried a few things before settling on this option, including paper soaked in diluted PVA glue, and metal foil from an old tube of tomato paste (or is it now tomato past? :-)). The paper was too springy and the foil too strong to bend well. Both might have other uses later. The laminated foil gave me the best compromise. The only problem is that it isn't super strong. I'll have to take care when painting. 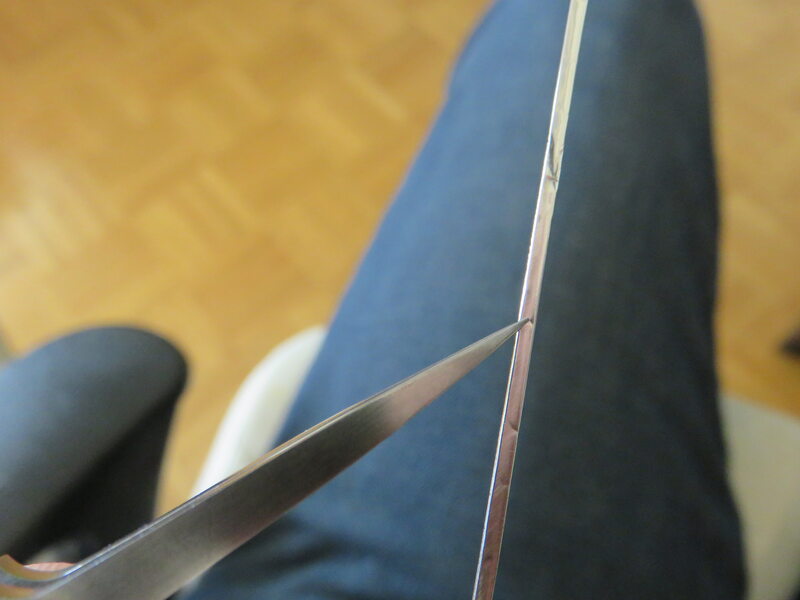 It isn't likely to fall apart but a careless poke can move it out of shape. I avoided some of the risk by supergluing the belts to the seat wherever they touched. I see what you mean about the cushion. It is a bit slab sided. True there are a few creases in it that don't show well right now, but once the rest of the seat belts are fitted there won't actually be much left to see. There's a snake's nest of belts to come. Lets see if they provide good camouflage. Thanks for looking in and for the constructive feedback too. Now that's super impressive to say the least. Like you, I've struggled with PE Belts & Harness both unpainted and painted, and they both are tricky to work with. The painted paints in my F6F-3 had the paint split right at the bend over the seat once again! So I'm going to try your method. I also like how you got the straps to thread though the tightening buckles. I'm sure it wasn't as easy as it looks. You have a lovely knack of making me feel good about my model making, and I suspect it works for other folks too. Thanks so much. Yes, give it a try. You will surely need to deploy some patience, and I was helped by some magnifying glasses too, but it is satisfying when it works. 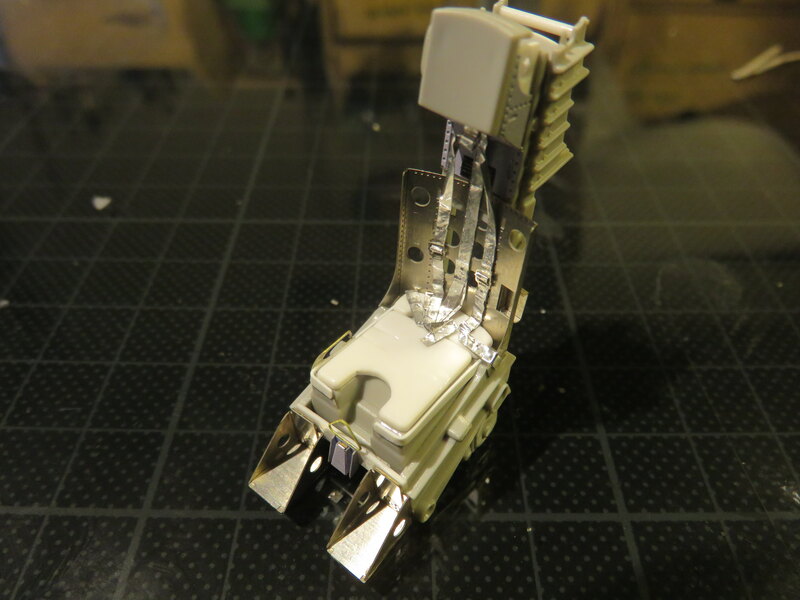 The laminated foil was strong enough to pull through PE buckles in 1/32 scale with a bit of care. Fingers crossed that it works for you. I'm old school, I'm only giving credit to where credit is do. Your work is IMPS National standards, then some. Your problem solving just turns on light bulbs for me. While some things like those buckles work well in 1/32, I'm not holding my breath for it to work as well in 1/48 scale. But it just might be a better approach then my doubling up masking tape, the cutting and shaping, which is still so much better then PE. I've gone to using Resin seats with molded on Belts and harnesses as the look just blows away PE ones. I've been lurking for a while and just had to comment on your fantastic work in the 'pit. The F104 is my favorite jet aircraft, and I've built a couple of the Hasegawa 1/32 kits, and still have a couple more in my stash. You're right about the "spaghetti" mess of straps in the cockpit-- the early F104 had a very interesting restraint system for the pilot, since it had downward ejection through the floor. The pilot wore special boots attached to cables at the heels that yanked his feet into the the bottom of the seat, and a side restraint strap system snapped around him when the ejection handle was pulled-- it must have been quite a shock. 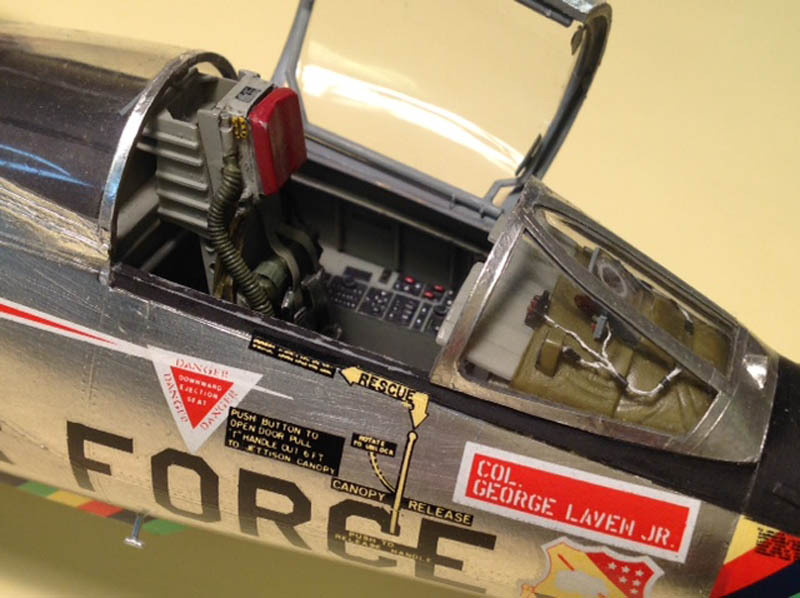 I wrote an article for Large Scale Planes on George Laven's colorful F104, and there are several articles on the Hasegawa and Italeri F104s at LSP, but your work sets a new standard. Here's a some shots of the cockpit in my F104 if you are interested, but your work goes far beyond, and is the ultimate 104-- what color scheme are you going to use? I got most of the cockpit detail diagrams from a series of Koku-Fan articles on the F104C. Well Steve and Gary. Now I'm suitably depressed. This is some excellent work. I'm sure I should stick to 1/72, my errors will only be 44% as large, and 3 times harder to see. Joel, its all a result of far too much time spent on kits both good and bad. I have to say that I get a big kick out of building a model, so I'm motivated! I find the trick is to experiment a lot away from the kit and of course learn from other guys too. Getting to shows is difficult for me - I live in Switzerland - but maybe one day. I'm toying with setting up a web site or Youtube channel to share techniques and make a place for folks to swap ideas too. That might be biting off more than I can chew (again). Russ, happy to have you out of the cupboard. Thanks so much for those links to your work. You have done a lovely job. Well, we live and learn. I'd never heard of Koku Fan before, but now I've Googled the mag. It looks like a great reference. I have inaccuracies in my ejector seat that I'm going to live with now. It just goes to show that you can never do too much research. Mark, yes our errors can drive us nuts and spoil the fun sometimes. I reckon that over the years about half of the kits I started have ended up in the bin because I messed up. I don't even want to figure out how much money that is thrown away. These days I bin less and I have a sort of personal rule that I never act out of exasperation. When I tipped a pot of Tamiya Extra Thin over the wing of my last build I was so tempted to bin the whole thing. I walked away and came back a few days later. Then it somehow looked less bad and I started a slow sanding and rescribing job. In the end it worked out. Whatever you choose I hope its a lot of fun and gives you a glow of pride to know you did it your way. a U tube channel is a ton of work as you're always looking at doing the next video, and that takes precious time away from modeling. The sharing of ideas and techniques is really what Aeroscale is all about, and you're part of the family here. What could better then posting your Vids here. I say go for it. You swung it for me. I'm going to experiment and then post something when it seems like I have something worth sharing. Watch this space for the first try. Looking forward to your 1st Video. Joel, it might be a way off. My first attempt was utterly lousy, so I went back to building. I need to practice!